Russell Castro is the State Wildlife Biologist for the Natural Resources Conservation Service (NRCS) and is headquartered in Temple, Texas. Castro provides leadership for the NRCS biology discipline in Texas. He coordinates and leads the efforts for the five NRCS zone biologists to meet the demands of landowner interest for conservation efforts addressing wildlife, wetlands, threatened and endangered species, etc. Castro also provides guidance for NRCS state leadership addressing policy and technical issues. 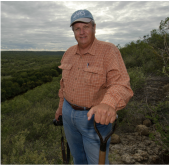 He has worked 35 years with the NRCS as a range management specialist in Zapata, Bandera, and Tulia counties; as a district conservationist in Edna; as a zone biologist in Terrell/Weatherford covering 51 counties; as a water resources biologist; and, presently, as the state wildlife biologist. 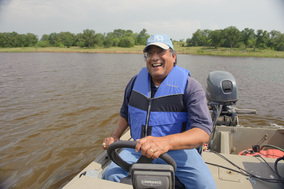 Castro serves as lead on the Texas NRCS Riparian Team and on several national NRCS working groups; is on the boards of the Oaks and Prairies Joint Venture and Rio Grande Joint Venture, and is a member of the State Comptroller's Science Team and the Endangered Species Task Force. Ricky Linex is a wildlife biologist for the Natural Resources Conservation Service (NRCS) headquartered in Weatherford, Texas. Linex works 51 counties in north central Texas covering the Rolling Plains, Cross Timbers, Blackland Prairie and Post Oak Savannah vegetational regions. He has worked 34 years with NRCS in Goldthwaite, Snyder, and Abilene, with the past 13 of those years in Weatherford. He serves as an instructor with the Rolling Plains Bobwhite Brigade and the North Texas Buckskin Brigade. Ricky serves as an instructor with the Rolling Plains Bobwhite Brigade and the North Texas Buckskin Brigade. In 2009, Linex was selected as Educator of the Year by the Texas Chapter, The Wildlife Society. He is the author of the brand new Range Plants of North Central Texas: A Land Users Guide to Their Identification, Value and Management, a plant identification book for north central Texas and elsewhere. This book has 324 grasses, forbs and woody plants of the area, and is full of definitive photos on each page. A valuable addition within this book is the detailed browsing, grazing and seed value of each plant for cattle, sheep, goats, deer, dove, quail and turkey. Nearly all the plant species listed in this book can be found throughout the state of Texas. Ricky is also the co-founder and editor of the very popular Texas quarterly e-publication, The Reverchon Naturalist. Longing is an assistant professor of entomology in the Department of Plant and Soil Science at Texas Tech University, where he teaches Introductory Entomology, Pesticides and Integrated Pest Management. 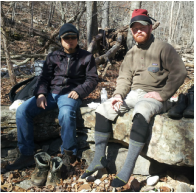 His research focuses on determining environmental drivers of aquatic and terrestrial insect communities across unique habitats of the southern United States, from headwater stream networks of the Appalachian and Ozark Mountains to the sandhills of western Texas. A major focus of research includes determining habitat associations and threats to endemic species of concern from these systems. Scott is directing current graduate and undergraduate students on multiple projects addressing pollinator communities across urban, agricultural and rangeland systems on the Southern High Plains. ​Recent international collaboration on pollinator decline includes Scott's contributions to a new book titled The Business of Bees: An Integrated Approach to Bee Decline and Corporate Responsibility. ﻿Carrie is a conservationist and naturalist of long standing, with a strong, abiding interest in ecological systems. She has planned and coordinated several successful, well-attended training seminars for naturalists, botanists, field researchers and others in the North Central Texas area in the past few years. Carrie has also labored intermittently at plant nurseries and grower's farms for the last decade, and has gardened since her earliest childhood when she stubbornly persisted in transplanting Alleghany Highland woodland wildflowers to the Shenandoah Valley year after year in spite of overwhelming and continual defeat. She is a certified Texas Master Naturalist, an Audubon Society Master Birder, a Botanical Research Institute of Texas Herbarium volunteer, a Texas Bluebird Society member, and a park ranger reserve at Dinosaur Valley State Park. Dawn has worked 20 years as a Research Associate with ﻿SFA Gardens ﻿at Stephen F. Austin Sate University in Nacogdoches, TX. Dawn earned a B.S. in Biology from West Texas A&M in 1996, and an M.S. in Agriculture with an emphasis in endangered plant conservation and reintroduction. She currently maintains the living plant collection and plant trials at SFA Gardens, is responsible for the horticultural nursery facilities and coordinates two succesful fundraising plant sales each year. She guest lectures for horticultural classes and labs at SFA, as well as to a wide range of garden enthusiasts. Currently, Dawn specializes in evaluation of ornamental native plants that provide habitat and forage for pollinators. She is working to create designed plant communities for pollinators throughout Nacogdoches, and initializing efforts to restore tall grass prairie along sections of the Lanana Creek Trail there as well.